Universal Color Corp., a family-owned business founded in 2006, recognized two important needs in the printing industry: high-quality inks to maximize pressroom efficiencies and highly technical, service-oriented personnel. Over the past decade, other companies have downsized leaving customers with very little resources when problems would arise. This void has allowed Universal Color Corp. to prove to our customers that our products and staff are of the highest standards in the industry. Printing is a challenging business, and print buyers are demanding. 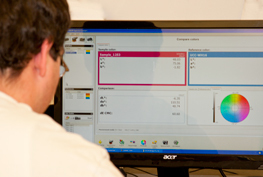 Universal Color Corp.'s goal is to achieve the quickest solutions by the most economical means. That is why we have developed an ongoing partnership with our customers to help them solve problems, gain advantages over their competitors, and become more profitable. Universal Color Corp.'s commitment to the environment has been a main focus since our inception. Constantly advocating the best eco-friendly raw materials, we have met and exceeded all regulatory and environmental standards while still maximizing print performance. Our line of soy inks satisfies the needs of many processes such as sheet fed, heatset, metallics, and U.V. products thus maximizing bio-renewable material and giving our customers the comfort of using eco-friendly products. The true opportunity for growth for Universal Color Corp. is from the 100% commitment of our people to help our customers become the best they can be.